Mrs. Edenfield is a partner with the law firm of Edenfield, Cox, Bruce & Edenfield in Statesboro, Georgia, where she maintains an active general practice. Her practice places an emphasis on business and contract litigation matters, as well as on personal injury, medical malpractice, and wrongful death claims. She also has an active agricultural law practice, where she has dealt with legal matters related to crop insurance, tobacco cooperatives, and seasonal migrant workers. She is admitted to practice in both state and federal trial and appellate courts in Georgia, as well as the U.S. Supreme Court. On the trial level, she has tried to verdict both medical malpractice and product liability cases. On the appellate level, she has argued before the Georgia Court of Appeals on multiple occasions, including successfully defending against class action certification on a business law claim. She has also argued before the U.S. Circuit Court of Appeals for the Eleventh Circuit on a state actor’s qualified immunity. Mrs. Edenfield is a graduate of the University of Georgia and she earned her law degree at the Walter F. George School of Law at Mercer University. Edenfield is active professionally, having served as the State Bar of Georgia’s Young Lawyers Division’s 68th President from 2014-2015 and as Secretary (2011-2012), Treasurer (2012-2013), President-Elect (2013-2014), and Immediate Past President (2015-2016). She has served on the State Bar’s Board of Governors (2013-2016) and the Board of Governors’ Executive Committee (2013-2016). Additionally, she served on the YLD Executive Council (2007-2016), as co-chair of the YLD Leadership Academy (2007-2011), and as co-editor of The YLD Review (2008-2010). Mrs. Edenfield is a Fellow of the American Bar Foundation and a Fellow of the Georgia Bar Foundation. Further, she is actively serving or has served on numerous committees related to the practice of law in Georgia, including the State Bar’s Disciplinary Investigative Panel (2013- 2014), the State Bar’s Disciplinary Review Panel (2011-2013, 2015-2016), and as a Trustee for the State Bar’s Client Security Fund (2008-2013). Additionally, she has held appointments by the Supreme Court of Georgia to its Access, Fairness, Public Trust, and Confidence Committee (2015-present), Commission on Continuing Lawyer Competency (2015-2016), Commission on the Unauthorized Practice of Law (2008-2014), as a Bar Exam Grader for its Commission on Bar Admissions (2009-2014), and as a Special Master in attorney disciplinary proceedings. 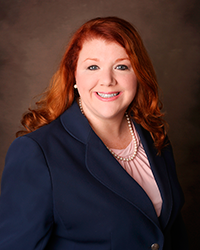 In addition to being a Statesboro litigation and personal injury attorney, Edenfield is also active in her community. She has served on the Boards of Directors for the Statesboro-Bulloch County Chamber of Commerce and the Statesboro Arts Council. She is also a member of the Professional Women of Statesboro, the Downtown Rotary Club of Statesboro, the Statesboro Service League, and the Bulloch County Bar Association. She has served as Vice President (2005-2006) and President (2006-2015) of the Gamma Alpha House Association, the non-profit corporation owning the Alpha Gamma Delta chapter house at The University of Georgia. While she was President, she spearheaded a $3 million dollar capital campaign to renovate and build on a new addition to the chapter house to provide the sorority members residing in the National Historic Register Property with the newest and most modern facility to live in while in college.